If you have any questions or want to enquire about dates, use our form to contact Renata Trulli. If you’re dreaming of a truly rustic break by the sea, away from modern paraphernalia, then head for the heel of Italy and these stone dwellings engulfed in wild Puglian flora. The path and steps leading up through rosemary, olive and prickly pear brings you first to the ancient, flat-topped Trullo house. Its bedroom transports you back centuries: a small space without windows, its mod cons are a ceiling fan and a screened door that stays open for light and air. Up steps to the main stone house with a double bedroom on each floor and a living area with wood-burning stove. There’s an indoor bathroom, and another one outdoors – along with two showers and an indoor and outdoor camping kitchen. It’s all perfectly basic, the focus on outdoor living, with three terraces plus a rooftop for superb sea views. Flop in a hammock or lounger and be lulled by Mediterranean scents and breezes. Tear yourself away to visit Santa Maria di Leuca at the tip of the heel, Novaglie, with its mini harbour and restaurants, or take a walking/boat tour to see the Grotta Zinzulusa – fabulous prehistoric caves. Return for more raw beauty – magical. Minimum stay: 4 nights. 7 nights in high season. Children over 13 welcome. 14 November - 31 March. The most peaceful and relaxing holiday we have had. The property is beautifully situated and well equipped. We spent so much time just sitting outside watching the ships on the Adriatic (be aware that the mosquitoes are very active so take strong repellent, especially against the Tiger mosquitoes). Renata very helpful, even looking out for us until our arrival just before midnight. Thank you Renata. We are planning to return next year. My husband and I had a delicious short stay at Special Ranne at the end of May. Perched high up a hill surrounded by nature and the lull of the sea. We watched the full moon rise over the Adriatic and couldn't help getting up early to watch the sunrise. It's a perfect spot for a secluded retreat, and the cottage is fitted with everything required for a long stay. Renata the owner was incredibly helpful, gave a great list of useful local information and was flexible with our check out time. We didn't want to leave! The house isn't suitable for people with mobility issues, but otherwise perfect. A very special place - just booked again for next year. Highly recommend. Renata was the perfect host, thanks again Kate, Charlotte & Clare. Private and quiet retreat above the sea. Once you enter your very own holiday parc through the gate from the main road and climb the stoney path to reach the main house. Perfect sea views, complete privacy and so very quiet. House has all it needs both in and outside! Many places to read, sit, dream away and watch the sea and the sky. Do not expect sandy beaches close by. Good shopping, restaurants can be found in Tricase, 10 minutes by car. We loved our 2 week stay and do recommend Specchia Ranne for quiet lovers without mobility issues. We loved staying here , booked to stay one week but extended for another week It's secluded , quiet, private , fabulous views , interior space very comfortable , Many outdoor spaces to retreat to . Renata is a wonderful charming woman , told us of the best local places to eat , to visit , to swim. We will return here for sure. Take a nice walk around the house or just a few minutes away along the rocky coast there are great routes for trekking up to Otranto with various levels of difficulty. The walks can also be organized for you. “Funnuvoiere” this is the name that locals give to a part of the coast, only 800m away from the house, still very well preserved, away from the crowded beaches of the Ionian Sea. Tricase is 6 km away. Do not miss “Castle square”: a jewel of Baroque architecture. Its greenhouse and its harbour it’s like taking a walk back in time. Every Tuesday a market takes place where you can find all kinds of local produce, including organic. The harbour of Novaglie is 2 km away. Nothing worldly but Biagio’s kiosk, where you can drink a beer in front of the sea listening to good music, it’s a memorable experience. You can take a trip by boat to discover the various caves in the area. Gallipoli and Otranto, so different from each other, are destinations that require at least a half day trip. Then St. Maria di Leuca, 9 km away, which is the ideal watershed between the two seas, deserves at least one visit. 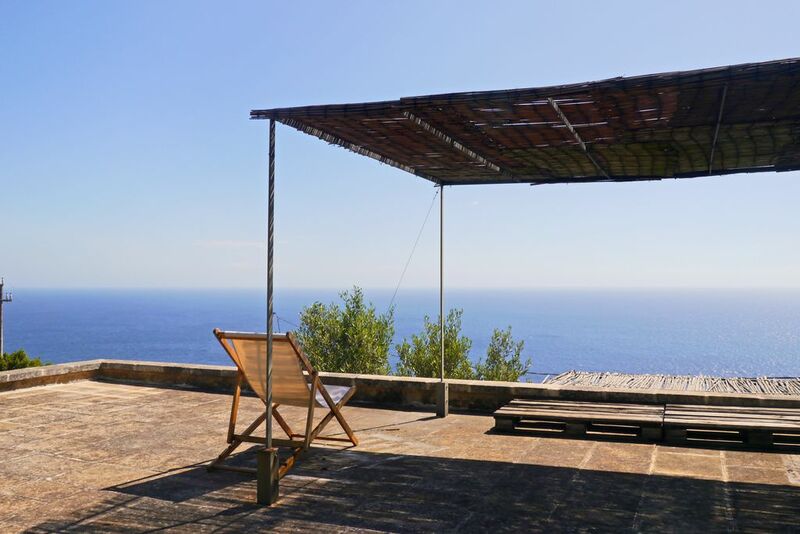 Finally if you take with you a good book and a good glass of wine or beer to the roof terrace of the house, with the sea on the horizon keeping you company and the foliage of the olive trees around you, it’s the perfect way to enjoy your holiday.